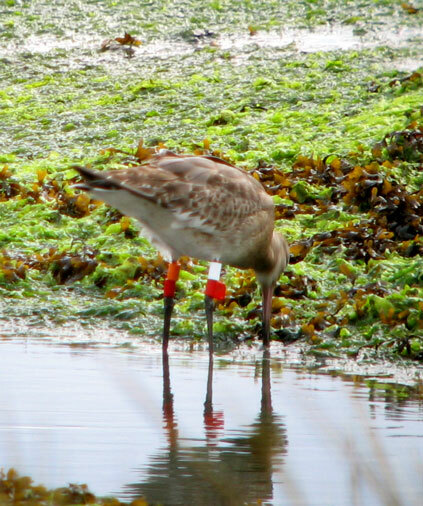 Black-tailed Godwits wearing four or six colour-rings are part of an international study of their movements around ireland and the rest of there wintering and breeding grounds. Many birds have been resighted several times and details of previous movements will be sent to the observer. As this process is dealt with by volunteers please allow two to three weeks for a response. Repeat sightings of birds at the same site are just as valuable as sightings of new birds so please send in any observations. Please record the COLOUR and POSITION of all four colour rings (see below). Also record: LOCATION, DATE and TIME, (grid reference if possible, available at Irish Grid References) and the NUMBER of Black-tailed Godwits present. NB! If you are not 100% sure of any colour ring seen please note this in your sighting report and only definite colour combinations are of value - no guessing please! A selection of Colour-ringed Black-tailed Godwits and how the colour combinations are recorded.